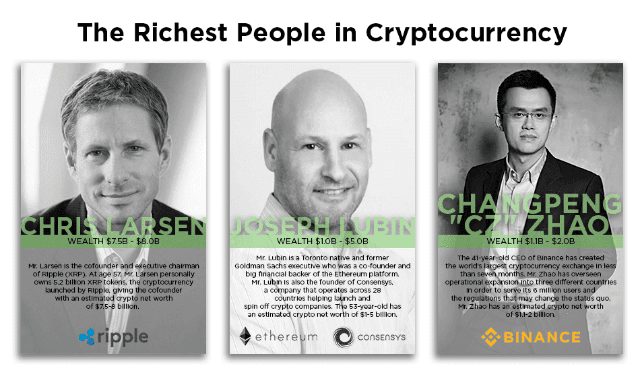 The Richest People In Cryptocurrency #Infographic ~ Visualistan '+g+"
Forbes recently released a list of the world’s richest individuals in terms of cryptocurrency. There are currently 19 people in the world who own an equivalent of more than $350 million in crypto assets. The top owners of cryptocurrency in the world amassed their wealth in a variety of ways, but most are founders of large cryptocurrency projects and cryptocurrency exchange platforms. Others are either individual investors or part of investment groups and some have established very profitable cryptocurrency mining operations. The one thing that the richest in crypto have in common is that they are all the types to “HODL” (hold on for dear life), meaning that they hold on to their cryptocurrency through any downturns in the market and aren’t quick to make crypto-to-crypto or crypto-to-fiat trades.